First place winners of the 2009 Ellis Piano Duo Competition, 882 (“88 Squared”) also won the Abild Prize for best performance of an American work. The duo received second prize and a Special Mention Award in the Two-Piano Division of Concours Grieg International Piano Competition in Oslo, Norway, where they performed with members of the Oslo Philharmonic. Recipients of Washington State University’s New Faculty Seed Grant, 882 commissioned and premiered new two-piano works by Heather Schmidt and Daniel Ott at their debut recital in Carnegie Hall’s Weill Recital Hall in February 2009. 882 was recently featured in recital at the National Federation of Music Clubs (NFMC) National Conferences in Orlando and metro DC, NFMC state conferences in Florida and Iowa, University of British Columbia Recital Series, Camerata Musica (WA), University of Puget Sound’s Piano Festival, the Washington State Music Teachers Association State Conference, and Victoria Conservatory of Music (Canada), and gave the east coast premiere of Liebermann’s new Sonata for Two Pianos at the 2012 Music Teachers National Association National Conference in New York City. The duo has performed at New York’s Lincoln Center, Rutgers Church Piano Recital Series in New York City, Bowdoin Music Festival, the Perlman Music Program, Auditorium Chamber Series (Idaho), University of Nevada, and was one of six chamber groups featured in the Chamber Music America Showcase in Long Beach, CA. 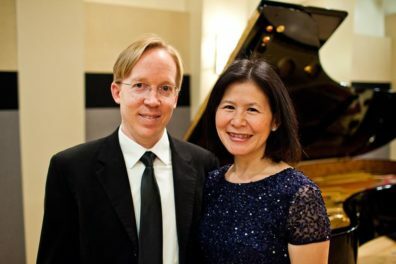 882 is comprised of married pianists Jeffrey Savage and Karen Hsiao Savage, both of whom completed master’s and doctoral degrees from The Juilliard School. While at Juilliard, Jeffrey and Karen were invited to perform for Juilliard’s board of directors and donors, where they shared the stage with Peter Schickele (PDQ Bach.) Individually, they have performed in venues such as Carnegie Hall’s Weill Hall, Shanghai Grand Theater, Merkin Hall, Alice Tully Hall, and Kyoto’s International Chamber Music Festival, and they have been top prizewinners in national Canadian and American competitions. Their teachers include Yoheved Kaplinsky, Jonathan Feldman, Angela Cheng, Robin and Winifred Wood. Jeffrey and Karen both serve on the piano faculty of Washington State University’s School of Music. Upcoming projects include international premieres of Lowell Liebermann’s Sonata for Two Pianos (2011) commissioned through grants from Washington State University, Artist Trust, Washington State Music Teachers Association, and the National Federation of Music Clubs, and a new CD recording of Liebermann’s two-piano works with the composer serving as producer.